Jammu and Kashmir Police in collaboration with an NGO “World Vision” organized a one day orientation programme on Juvenile Justice for the officials of Jammu & Kashmir Police at PHQ Auditorium Srinagar. IGP Kashmir SP Pani speaking during orientation programme on Juvenile Justice. A police spokesperson in a statement said that the orientation programme was attended by several Juvenile Police Officers of the valley and other officials of J&K Police. IGP Kashmir S P Pani-IPS in his inaugural address emphasized on the need to understand and sensitize the society regarding the rights of children. IGP Kashmir stressed that Juvenile Justice act is a progressive law and police being a custodian of law has a strong role to play. Further emphasizing that with the changing relationships due to advent of technology, new emerging challenges have to be addressed in a new manner. 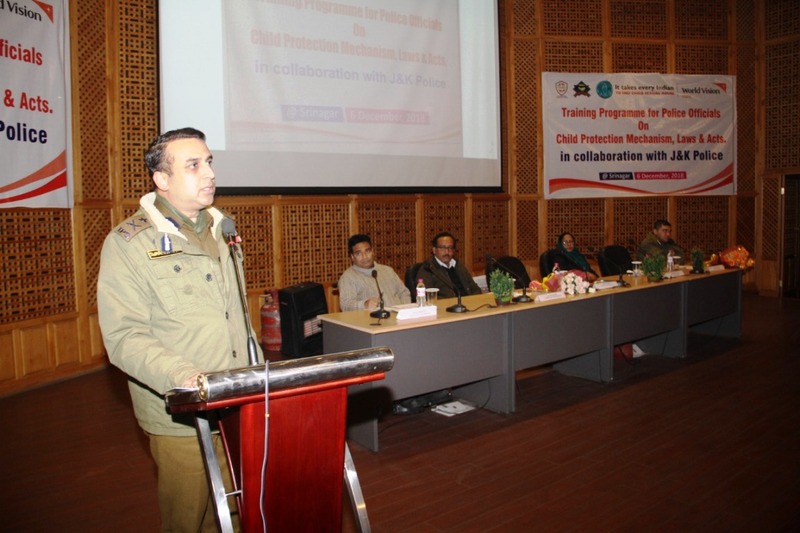 Explaining the constructs of Juvenile Justice Law, IGP Kashmir emphasized on the participants to understand the legislations of the act and explore the skills in young officers for implementation of this law at the ground level. IGP Kashmir appreciated the functioning of Juvenile Justice boards and expressed hope that it will bring new reforms in a manner in which justice is dispensed to juveniles. Dr Anjana P, Senior Director at World Vision with the aid of short film demonstrated to the participating officers about the need to identify the children facing violence and abuse from their environment and consequent steps to be taken to put an end to such violence. She emphasized on the need to raise awareness in the communities and general public to address aberrations in values, attitudes and behaviors which condone sexual abuse and exploitation of children. Shanti Hooper, an associate of World Vision gave a comprehensive overview of child sexual abuse and the prevailing situation in the country. She emphasized on the need for educating children about sexual abuse so that cases of such nature are reported to authorities. Dr Rouf, member ICPS selection oversight committee on child rights explored the importance of education and awareness among the law enforcement officers and police officers regarding the Juvenile Justice act. Further through the aid of audio visual, he explained how neglecting of Juvenile rights has affected the health and education of our society and consequently affected our overall growth. Explaining further he highlighted the importance of creating a caring environment for curbing violence against children. He urged for the strengthening and effective implementation of laws and policies that protect children from sexual abuse and exploitation.